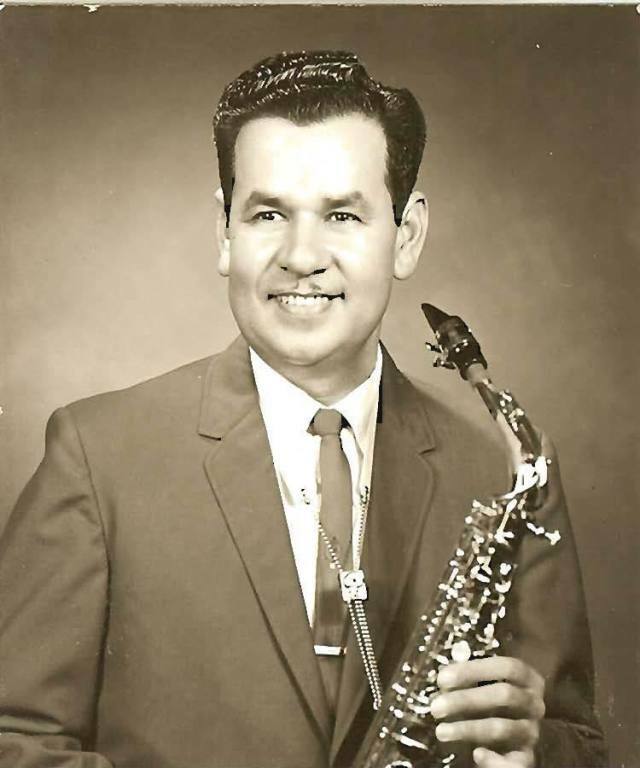 Anselmo “Chemiro” Martínez was a star before music was termed conjunto, orquesta música tejana, la onda Chicana or Tejano music. Martínez was born on April 21, 1927 in Donley, Texas and raised in Hondo. As for his nickname, Chemo, as he was called at home, said it came about as the result of a first grade school Valentine Day’s party. “You see, I got his card from my cousin Juanita ‘Janie’ Alcorta; and when the teacher read the name on the envelope, she pronounced it ‘Chemiro’ and it stuck,” Martínez said during an interview at his Westside San Antonio home. Then without wasting one minute as he showed this writer dozens of rare photographs and records, he began to talk about his roots. His father, Jesús Martínez, played a 12-string guitar and sang in duet with his uncle, José Martínez, who played accordion and did second voice. Cruz Ramírez, also on accordion; and Isidro Sauceda, on violin, made up the rest of the group. He was seven when his mother died and his father put his guitar in a flour sack and hung it on a nail on the wall. After mourning his wife for a year, his father took down his guitar. “That’s when I started tinkering with it,” Martínez said. At 11, he made his artistic debut singing “El Rancho Grande” and “Adios María” at St. John’s Catholic Church in Hondo. From that day on, he sang Spanish-language hymns at Mass each Sunday. In 1945, he was drafted into the Army-Air Force. During this period, he recorded “Ventanita Reja De Oro” and “Luna Platiada” direct to acetate. “It was just me and my guitar,” Martínez said. In 1955, he decided to make San Antonio his home and purchased a home on Irma Avenue in the city’s Westside. However, he kept his full-time job in Hondo. That same year, he became part of the “Compositores y Vocalistas de Texas” one-hour live-television show where he sang “Todavia Yo Existo.” Other artists featured on this program, hosted by Maber, were Rosita Fernández, Lydia Mendoza, Las Hnas Mendoza, José Morante, Emma Hernández, Ada García, Daniel Garzes, Hilda Jiménez, Andy Álvarez and Trio Las Conquistadores. Martínez also appeared on the “Arthur Godfrey Talent Show” and was invited to appear on the “Ed Sullivan Show,” but was unable to accept. In 1956, the 88-year-old living legend joined the Pete Portillo Orchestra, where he sang and played guitar, and started touring all over Texas until 1958. Up to this time, Martínez had not recorded as El Trovador, or with Portillo’s orchestra. Noting the success of Isidro López, Juan Colorado, Balde Gonzales, Chris Sandoval, Mike Ornelas and other orchestra leaders, on January 10, 1959, after rehearsing a group of six musicians, the Anselmo Martínez Orchestra joined their ranks and made their debut at the Olmos Dinner Club. “It was easy to get gigs without people hearing the orchestra because they had already seen and heard me sing with Pete Portillo,” Martínez said. Martínez, vocals and guitar; Jimmy Carranza, bass; Paulino Olguin, trumpet; Jesse Olguin, saxophone; Robert Felan, saxophone; and Ernesto Flores, drums; made up the orchestra. According to Martínez, the first single he recorded was “Te Vi La Prueba” and “Vuelve A Mi Vida” for Jaimé Wolf’s Rio Records, who only used one microphone for both vocalist and orchestra. Still both songs became hits. Next came “Lloro Por Ti” and “La Trinidad Polka,” a 78 rpm single, on Manuel Rángel’s RMC (Rángel Music Co.) label aka Corona Records. “This time we recorded the single with one microphone for the vocalist and a second mike for the entire orchestra,” Martínez recalled. “Nadie Nos Separara” and “Caminos Chuecos” followed and the latter became their all-time greatest hit. It is a tune that has been recorded by, at last count, 65 different vocalists and groups. By now Rángel had 24 singles he could package into albums and the company released four albums on the RMC label. His second album for RMC contained “El Chemiro,” an instrumental with such a unique rhythm that it became a new popular dance. “I created a two-step dance. We had dancers and even printed a bunch of bumper stickers with the steps to the ‘Chemiro’ dance. It was during this period that Anselmo and Jimmy Martínez recorded an album for José Morante’s Sombrero label. Next the two brothers plus Trini Martínez united to record La Muerte de José album on Del Mar Records as Los Famosos Hermanos – Los Tres Martínez. The Tejano Music Hall of Fame inductee was so popular, Antonio Aguilar, who had met with Martínez at the Gunter Hotel here, flew him to Mexico City where he offered him a part in “El Mujeriejo,” but Martínez was afraid to leave the security of his full-time job in Hondo. Little did Martínez realize he would be so much in demand, that he would wind up quitting the next year and go on to make tens of thousands of fans happy from coast-to-coast in forty states. In 1965, Martínez formed Chemiro Records. Four albums and over 100 singles later, he was unable to keep up with the demands of touring and heading a record label. So his brother Trini Martínez took over and changed the label’s name to BEMA after his wife, Bertha Martínez. During his lengthy career, Martínez shared the stage with Bill Haley and the Comets, Trio Los Panchos, Celia Cruz y Sonora Mantancera, Pablo Beltran Ruiz, Mike Laurie, Irma Dorantes, Sonora Santanera, Lalo Guerrero, Maríano Merceron and Vicente Fernández to name a few. “The youngest of my four children, John Martín Martínez, was born in 1969 and my wife started taking him to my dances since before he could walk and by four, he would take his toy guitar and stand between my guitar and bass players. He was never shy; and years later he would play the güiro,” the hall of fame inductee said of the recording artist we now know as Jonny Martínez. As a band-leader, Martínez was responsible to giving many of today’s best known musicians their first chance, when they were just wet-behind-the-ear kids. Some of those musicians are Henry Balderrama, Dimas García and Danny Pérez, guitar; Cruz Hernández, bass; Joe Revélez, keyboards; Al Gómez and Charlie McBurney, trumpet; Louie Bustos and Abel Hernández, alto and tenor saxophone; plus Lencho Trujillo, accordion and bass. And even Joe Farias even recorded with Martínez. Asked who he owed his success to; Martínez answered, “I have a daughter that’s a nun. She’s always prayed for me. And I believe that if I reached the top, it was because of her prayers. She is Sister Betty Ann Martínez, now mother superior in Newton, New Jersey,” the unstoppable 88-year-old musician said. The last version of his orchestra, Martínez, vocals; Larry, accordion; Rubén García, guitar; Tony, bass; Tony Muñiz, saxophone; his nephew Jerry Martínez, trumpet; Max González, trumpet; and his oldest son Ricardo “Rick” Martínez, drums; officially called it quits in 1978. During his long career, Martínez also recorded for the Cobra, Aguarela, and Magda labels. So whatever happened to Anselmo Martínez? Truth be told, Martínez has not really stopped recording, or performing. In fact, he and his son Jonny just held a CD Release Party at the Cadillac Bar on September 22 to introduce Admirando A Mi Padre, which includes seven of Chemiro’s compositions/hits from “Caminos Chuecos,” “Anoche”from the Sombrero album, “Mi Nombre Completo” from the Del Mar DM-1003 album to the hauntingly beautiful “No Te Olvides Que Te Quiero” ballad, the latter in duet with his granddaughter, Crystal M. Caballero – also “El Paraiso,” an awe inspiring gospel tune from his Christian CD. As for his next live performance, the pioneer orchestra leader and Jonny will be performing as part of the Tejanos In Paradise seven-day cruise on a Carnival Breeze ship that sails from Galveston on Sunday, January 8th and returns on Sunday, January 15th 2017. www.TejanosinParadise.com or 512-659-2546 or 512-375-5711.